When Saturn moved into the cardinal sign of Libra last fall, joining Pluto in cardinal Capricorn, it signaled the beginning of the shift to cardinal dominance of the outer planets. By mid-year 2010, both Jupiter and Uranus will spend some time in the most cardinal sign of all, Aries, before moving back into Pisces one last time. What does this mean? For one thing, taking action will be the preferred mode of response as opposed to the endless discussions of the years when both Saturn and Pluto were in the mutable signs, Virgo and Sagittarius, along with Uranus in Pisces. My very Aries spouse will always chose to do something, even if it’s wrong, over sitting around talking about it. I happen to go along with this, because both my Sun and Moon are in Libra, and one of my pet peeves is listening to people moan about what’s wrong with their lives but refusing to take one step in any direction to change their situation. All of you with your Sun in Aries, Cancer, Libra, and Capricorn will understand the need for prompt action. Even if your chart has plenty in fixed and mutable signs, in your heart of hearts, you understand why doing something is better than doing nothing. Gemini folk likely will be happy, too, because anything new and different is OK in their book. The same could be said of Sagittarius, as they are generally open to new experiences. It’s the fixed signs who could be thrown the most by this shift – Taurus, Leo, Scorpio and Aquarius – because they are not crazy about changes of any sort unless they have direct control over it. Don’t be surprised if you hear grumbling from that contingent. The number of planets in cardinal signs will ebb and flow over the course of 2010, but we may as well get accustomed to this energy, because 2011 will bring Jupiter and Uranus in Aries, Saturn in Libra, and Pluto in Capricorn. My take is that where we saw grumbling in dissatisfaction before, we will see people taking direct action from here forward. We all need to sharpen our listening skills and be prepared to respond quickly or suffer the consequences! Good fortune and bon voyage! Image: Transition zone. 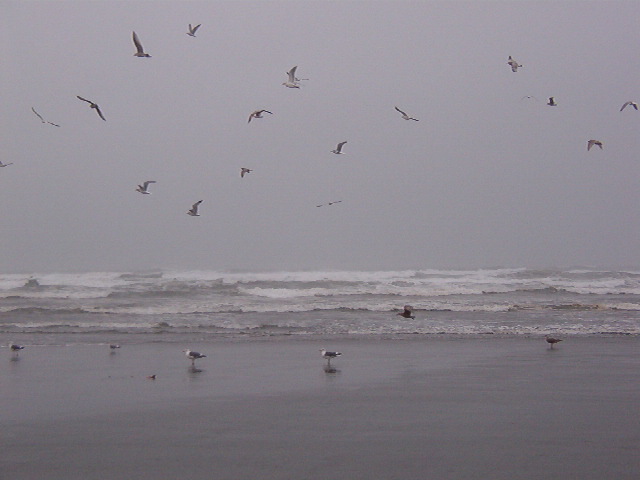 Pat shot this photo recently on a rainy day at Ocean Shores, WA. There is something very special about the transition zone where the ocean meets the land — one of my favorite places to walk ever. This image also is a reminder that change is random and uncontrollable, yet it is constant and the one thing we can count on. Photo by Pat Paquette, all rights reserved. This entry was posted in About astrology, Saturday Extra! and tagged Jupiter in Aries, Pluto in Capricorn, Saturn in Libra, Uranus in Aries on December 31, 2009 by Pat. I’m a Natal Aq but all my chart angles are in Cardinal signs. I have always been a person who likes to do rather than sit and talk (well talk about it as well but do). I used to work in a unit where the staff that had been there a long time always moaned about the place but never took any steps to do anything about it – despite they all had very marketable skills. Hopefully, this impetus will mean that the steps I take this year will be purposeful ones that lead to results rather than the one step forward, 2 back it has felt like in the last couple of years…. Absolutely agreed on doing something is better than doing nothing. Thank you for pointing that out. I’ve blamed myself for an inability to sit still, but I realize it’s because there is so much to do. But after I’m done, it’s OK to sit back and pop in a movie :). This shift bodes well for early Aquarius since both Aries & Libra are supportive. However, when things start to happen, it could come in very fast so best be prepared! Even though I have lived inland most of my life, I cherish my memories of living near the ocean. There are positive feelings associated with the sounds & smells of salt water beaches and docks. But after I’m done, it’s OK to sit back and pop in a movie :).